What is a Klondike Derby ? Sled and equipment inspection. Are they prepared with the right equipment ? Build a fire in the snow using only 3 matches and cook a complete meal for the whole patrol on it. They have to cook a hot drink, meat and a vegetable on the fire they build. Where do you find dry wood for a fire ? How can you start a fire without matches, using flint and steel or fire by friction ? What can you find to eat ? How do you build a shelter to get out of the elements ? How do you build a bed to sleep in and keep warm ? Then demonstrate how to do these. Pitching a tent in the snow, frozen ground or ice. Pioneering - Lashing and Knots - building useful projects. Cutting wood with a hachet, ax and bow saw. Emergency Search and Rescue competitions. Tests on how to search for a lost person, what to do if you get lost, how to pull someone out of the water if the fall through the ice on a river, pond or lake. These are play acting scenarios, no one actually is the victim here, they just pretend it happens to learn what to do and how to do it. A sled race with a heavy load. Sometimes bricks or cement blocks are loaded on each sled and they see who can pull the load a given distance the fastest. Four men walking on one set of skis. A contest of team work where everyone has to move their feet in unison. Usually all the traveling and the tests are performed on Saturday morning/afternoon and all of them are timed on a stop watch and count toward ribbons that are presented at the Saturday night camp fire. When is a Klondike Derby ? Klondike Derbies are usually held in January and February each year, when there is the best chance of having a good layer of snow on the ground. Sometimes mother nature doesn't supply the needed snow and the Scouts make do in the rain, mud, slush, or even on just frozen ground. The Scouts never know what they'll be working with until the weekend of the event, so they have to be prepared for anything. All BSA Councils hold there Kloondike Derby on different weekends. You can find some Klondike Derbies dates listed (during the fall & winter months) by clicking here on our Scouts NewEngland Outing Calendar. Hold down your right mouse button and select "Back" to return here. 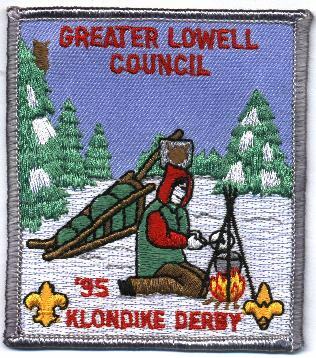 Who can attend a Klondike Derby ? Boys Scouts, Varsity Scouts, Explorer and Venture Scouts are the ones that this event is intended for. Sometimes Webelos Cub Scouts are invited to attend as the guest of a Boy Scout Troop or the BSA Council and stay for the day events. When Webelos compete, they usually do it against other Scouts their own age and use their own sled for their Den. The skills tests for Webelos are not usually as strenuous or difficult as what the older Scouts do, but it gives the younger Scouts a good idea of what to expect when they become Boy Scouts. Every BSA Council has their own rules for this event. What kind of equipment do you need at a Klondike Derby ? The Sled -- Every competing team (patrol/den) of Scouts needs a Klondike Derby Sled. The sleds are fashioned to look somewhat like Alaskan Dog Sleds. Some materials that are used include, plywood, 1x2's, 1x4's, 2x4's pine boards, old fiberglass and wood skis are sometimes used for the runners, sometimes PVC pipes are used to form the body of the sled, wooden dowels, old broom sticks and handles, wood screws, nuts and bolts, rope, etc... It's not recommend to use nails in the construction of the sled because they come loose under the stress/strain and banging the sleds take. See the same plans as above as a GIF file. Click on this: Plans File Size 187,690 Bytes. See another example of a set of plans and a materials list for a sled that are web page based. Click on this: Plans to go to another site, hold down your right mouse button and select "Back" to return to this page when done. 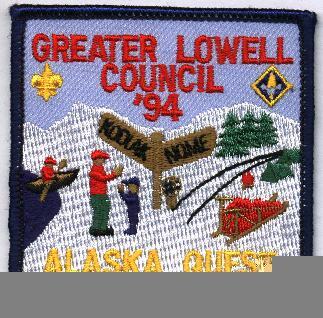 Clothing -- The Scouts also need good outdoor winter clothing, such as long johns (thermal underwear), gloves, hats, warm coats, multiple pairs of socks, good waterproof boots, rain gear, etc... basically to be prepared for a long cold weekend in cold, wet, snow. The best idea is to dress in layers, so that layers can be taken off when you're hot from working or more layers can be put on if you're cold.